Malmaison Glasgow can be found in West George Street, on the west side of Glasgow city centre a little south of Sauchiehall Street and ideally placed to take advantage of all that the city has to offer. As you would expect from a Malmaison, this is a hotel which breaks the mould of city centre hotels and is perfect for someone looking for somewhere with a distinctive and memorable character, and which offers excellent food: you can read our dining review for Malmaison Glasgow here. Malmaison Glasgow opened in September 1994, just a month after the very first Malmaison opened overlooking the waterfront in Leith. It occupies a striking building in a striking setting. St Jude's was built as the home of the Greek Orthodox Church in Scotland and was designed by the architect John Stephen in 1838. The Malmaison vision is all about "individual hotels for individual people" and "classic contemporary hotels with traditional French style cafe bars and brasseries": and, we would add, oodles of French chic. 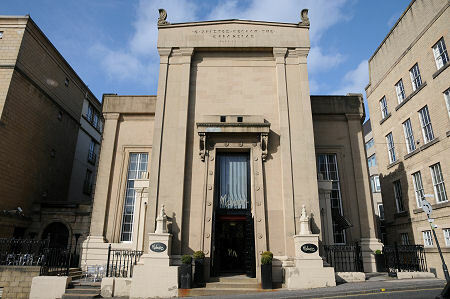 The first two Malmaisons were at the forefront of the introduction of the concept of the boutique hotel into Scotland. The name seeks to sum up the style the group stands for, and comes from the Château de Malmaison, seven miles from Paris, which was purchased in April 1797 by Josephine de Beauharnais for herself and her husband Napoleon Bonaparte: he was away at the time in Egypt building an empire and, she hoped, making enough money to pay for the Château. You enter Malmaison Glasgow through the grand front entrance into the double height reception area complete with its superb wrought iron staircase telling the story of Napoleon and Josephine. Here you get your first feel of the Malmaison style, with dark wood panels and sophisticated, comfortable palette of colours. From the reception you progress to the champagne bar on the hotel's lower ground floor, flooded with light during the day from the glass ceiling high overhead. The champagne bar in effect occupies what would other wise have been a gap between the church and the extension and is in many ways the most attractive space in the hotel, with large models of WWI aircraft hanging overhead. The brasserie can be found in what was originally the crypt of the church, now decked out in dark wood and leather and is reached by descending from the reception or on a level from the champagne bar. There are two private dining rooms off the brasserie, available for groups of up to 12. Also available and accessed from the champagne bar, are two meeting or function rooms which allow the Malmaison style to be enjoyed by groups of up to 20 or 45 in theatre layout. And for those wanting to balance any overindulgence, Malmaison Glasgow offers Gymtonic, a high tech fitness room with windows overlooking the glass roof the the champagne bar. There are 72 en-suite guest rooms available at Malmaison Glasgow, including eight suites. 51 of these were part of the original hotel when it opened in 1994 and are slightly darker and more atmospheric in feel. The rooms added in a new wing during a major expansion of the hotel in 1997 are furnished and decorated in slightly lighter shades. All rooms have a distinctly boutique edge and the "classic contemporary" style favoured by Malmaison is applied throughout. All are highly appointed and equipped. Prints and black and white photographs adorn the walls. In all there are 59 double or twin rooms; 5 superior doubles; 4 mezzanine suites; 3 one bedroom suites; and the main suite, known as "The Big Yin" in honour of Glasgow comedian Billy Connolly. Rooms have a variety of outlooks, and it is worth remembering that the hotel is in the centre of a city not known for wide views or scenery, so those are not among the attractions on offer in most rooms. Disabled access at Malmaison Glasgow is via a doorway to the side of the main entrance that bypasses the front steps, and from the reception level there is lift access to other floors. Guest rooms adapted for use by disabled guests are available. Malmaison Glasgow certainly delivers on the Malmaison theme of quirkiness and style, and we found our stay enhanced by excellent service, especially in the bar and bistro. 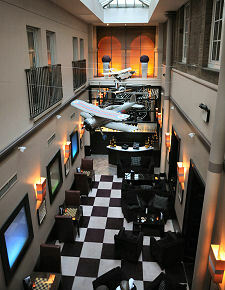 You can read our dining review for Malmaison Glasgow here.